Covington is in the midst of a redevelopment wave. A number of prominent historic buildings have recently been rehabbed and several large new mixed-use buildings are in the planning stages or under construction. Two of the new projects, “Riverhaus” at 501 Main Street, and the John R. Green Lofts at 411 West 6th Street are scheduled to bring 369 new apartments into the Main Strasse neighborhood. Census tract 603 covers most of the Main Strasse neighborhood and it shows 1,491 residents living there in 2015. Those two new projects will add a significant increase in the local residential population density. Their ongoing progress reflects the demand for residential development in pedestrian-friendly urban spaces. Part of Covington’s urban core that hasn’t seen any new residential development is the area north of 4th street between Madison Ave. and I-75. Dubbed “Hamburger Heaven” in the city’s recent City Center Action plan, it contains multiple fast food restaurants, the sprawling one-story IRS center, and a sea of parking lots. Part of the reason the area hasn’t seen any development is that Covington’s 4th Street delivers 27,000+ cars per day to I-75. That much traffic is incompatible with pedestrian-friendly urban space. The City Center Action Plan makes redevelopment of the Hamburger Heaven and IRS sites a priority but it does not address the area’s inhospitable traffic. It’s a problem: How do you connect new development north of 4th street to the existing pedestrian-friendly urban fabric while maintaining all the traffic to the interstate? The imminent closure of the IRS site presents an opportunity to address the problem. The 23-acre site covers 3-1/2 blocks of frontage on 4th street. Most of the remaining space adjacent to 4th street between the IRS site and I-75 consists of parking lots. Once the IRS site is closed, the city of Covington should widen 4th street and convert it into a multiway boulevard. 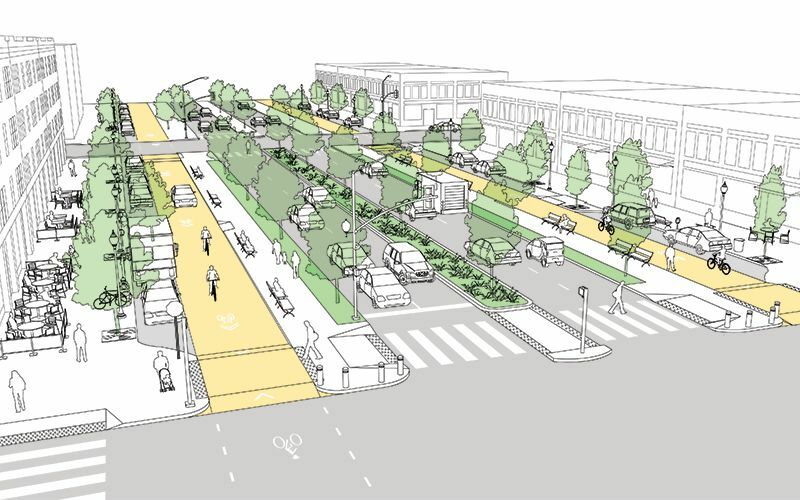 A multiway boulevard consists of a series of central lanes to move through-traffic, side lanes with on-street parking to serve local vehicles and bicycles, and broad sidewalks to serve pedestrians. Tree-lined medians separate the local traffic from through-traffic, and trees on the sidewalk further separate pedestrians from traffic. Think of it as a “mixed-use street.” Because the street supports a different mix of uses – people, bicycles, transit, through traffic – it can more readily support mixed-use buildings at its edges. Mixed-use buildings add the density and diversity of uses that support pedestrian-friendly urban space. San Francisco recently took an existing street and converted a portion of it into a new multiway boulevard. The creation of Octavia Boulevard was possible because an earthquake damaged a freeway and made it unusable. 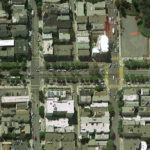 Instead of rebuilding the freeway, San Francisco added its right-of-way to a four-block stretch of Octavia Street, which became Octavia Boulevard. Today, Octavia Boulevard moves 45,000 cars per day in two directions, it has side streets and broad sidewalks to serve local residents, and the creation of the street spurred new development on its edges. Octavia Boulevard sets a clear precedent for converting underutilized auto-oriented development into more productive mixed-use urban development. Octavia Boulevard is aesthetically pleasing, practical at moving traffic, and successful at promoting economic development. To implement Covington’s “4th Street Boulevard Project” the street’s existing 50-foot right-of-way would be widened to the north to create a 100+ foot wide right-of-way. The expanded right-of-way will accommodate the multiway boulevard’s additional lanes, medians, and sidewalks. Expanding the right-of-way will require part of the IRS parcel, a number of parking lots, and the demolition of a fast food chain restaurant. Different design options could include making 4th street’s through lanes either one-way or two-way. 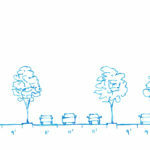 A dedicated transit lane could be accommodated. Bicycles can share the local lanes with local vehicular traffic. Implementing the 4th Street Boulevard Project would have multiple effects that support the ongoing urban renaissance. The medians and parked cars provide protection for people to walk, eat, drink, and socialize outside. 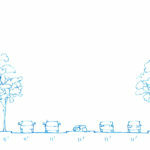 Trees also protect pedestrians and provide a canopy for shade and cooling. Bicycle use will be safe and easy. 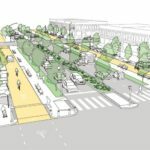 Converting 4th street from a single use – channeling cars to I-75 – into a multiway boulevard will facilitate the development of dense mixed-use buildings. There’s a historic opportunity here. 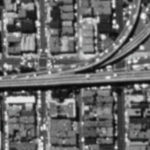 The IRS site was born out of federal urban renewal projects in the 1950s. Its time is now at an end. The trend of the future is to live, work, and play in the urban core. The current traffic on 4th street is a barrier to urban development. Converting 4th street into a multi-way boulevard will support the traffic flow but mitigate its negative impacts. Recent examples provide good evidence. 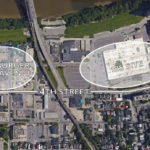 If the ongoing urban development is to be sustained and space north of 4th street – just blocks away from the Ohio River – is to be put to its highest and best use, then the traffic along 4th street must be addressed. Converting 4th street into a multiway boulevard will do just that. This is a guest editorial by Chris Meyer that originally appeared in the CNU Midwest blog. CNU and CNU Midwest are content partners with UrbanCincy.